Professor Tolkien signed this 1974 Allen&Unwin-issued calendar for Professor George Temple, a colleague at Oxford. Read the letter of provenance below. It may be unique in that it has both his "classic" JRR Tolkien signature and a personal inscription signed "Ronald." The calendar was issued in August of 1973. While it is possible that he obtained some of them from the publisher somewhat before August, Professor Tolkien passed away on 2 September 1973. Thus, it would be one of the last items that he signed. This calendar, inscribed George from Ronald and signed JRR Tolkien was given to my husband, Professor Dominic Welsh, by George Temple himself. George F.W. Temple (1901 – 1992) converted to Catholicism in 1919 and enjoyed close friendships with a number of Dominicans and Benedictines. This is relevant to his friendship with Tolkien. He also knew Dr Robert Havard, an Inkling and a Roman Catholic, and they used to drink beer together and talk. He became Sedleian Professor of Natural Philosophy at Oxford in 1953 and retired in 1968. He then started work on ‘100 Years of Mathematics’, published in 1981, Dominic helped him in this in a small way. Dominic first got to know Temple quite well when he was a Junior Lecturer in Mathematics and they both used to go to the Chaplaincy a lot. He had had some contact with him as an undergraduate, both when attending Temple’s lectures, and also through his third-year landlady, Val Huddleston who was a close friend of Temple’s wife, Dorothy. They had no children. This acquaintance/friendship grew the longer Dominic was in the Mathematics Faculty with him. 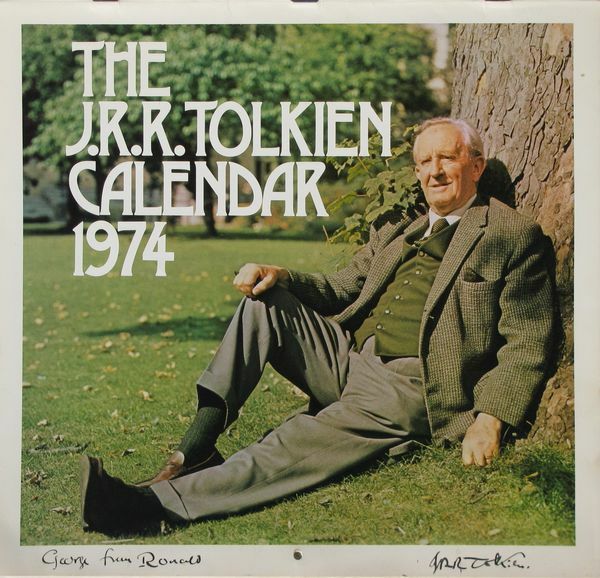 George knew from Dominic that our son John was very keen on Tolkien, and so when he moved to Quarr Abbey at Ryde in the Isle of Wight in 1980 after the death of his wife in 1979 he gave us his collection of books by Tolkien, some letters and this calendar. George was ordained priest in 1983 and died in January, 1992. When Dominic was an undergraduate he hardly saw Tolkien as he retired in 1959 and was a ‘famous professor’. He did get to know him when he returned to live in Merton College in 1971 after the death of his wife. Dominic was then a Fellow and Principle of Postmasters, and Tolkien was an Honorary Fellow; they also met at church, particularly at St Anthony of Padua RC Church on Headley Way, Oxford. Dominic never felt that he got to know Tolkien very well as he had trouble understanding him when he spoke. I had only one close encounter with Tolkien, standing in the bank we must have shared ( it was a small branch) waiting my turn, and being astonished to hear Tolkien being loudly advised that he had too much money in his current account and should move some to a savings account. The amount was £12,000, an immense sum in those days, I am sure it would have bought a house even in an expensive area like Oxford. We are not absolutely certain, but it looks to us as if the photo on the front of this calendar was taken in the Fellows Garden at Merton. The trees in the photo are still there, amazingly enough, as there has been a great felling for safety reasons in the interim.